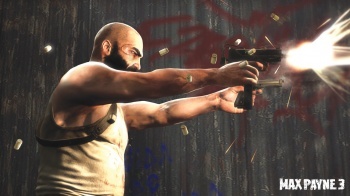 Don't go holding your breath for Max Payne 3 or Rockstar's Agent anytime soon. With the completion of Duke Nukem Forever, gamers everywhere are going to need a new "King of Vaporware" to joke about. Alan Wake came out last year, L.A. Noire just did the same, and Diablo III hasn't been in the public eye long enough to have quite the same kick. Don't give up hope, though! Still in the running is Rockstar North's PS3 spy game Agent, which was first mentioned way back in 2007. In a Take-Two investor call today, the publisher refused to say anything about the title beyond that it was still "in development." So, it's unlikely that we'll see anything new about it at this year's E3, at the very least. Similarly "in development," according to the call, was Max Payne 3. This game isn't nearly as bad off as Agent - it was only announced back in 2009, and we've actually seen some screenshots since then. But as with Agent, we have no word on when we'll ever see Max Payne in action again - or even a target window. Still, even the four-year-wait of Agent feels minuscule next to the seven-ish years of L.A. Noire - let alone the fourteen years of Duke Nukem Forever. It could be worse, too: At least we know that the titles are actually being developed unlike some other games I could name. Some other games that start with an "H."
And that end with an "alf-Life 2: Episode 3."